Much has been said about the nature of causality. Scientists, philosophers and theologians have offered different perspective as to whether causality should be seen as a universal law and a necessary relation between two things, one of which brings about the other into existence, or a mere coincidence between two things which has no reality of its own let alone the creative power of bringing a thing into being. The theological view asserted that God alone is the real cause of all things and His will is not to be subjected to causality in the sense of a necessary cause and effect relationship. The question may thus be asked: what is the cause of a stone falling to the ground when it is thrown? Is it the muscular movement of the hand, the law of gravity, the nature of the stone, as opposed for example to the feather, the will of the person who throws it, or the potential in each case that God has endowed them with? Scholastic philosophy attributes to Aristotle the distinction between four types of causes: The material cause or what a thing is made of, the formal cause, or what makes a thing be what it is, the efficient cause or what acts in order to make something exist, and the final cause, or why a thing is and what is the end purpose for which a change is produced therein. In the example cited , the efficient cause would be the act of throwing the stone. It is this efficient cause which lies at the centre of causality in logic and philosophy. The efficient cause is thus understood not to be referring to the potentials of things but to what acts in order to make something exist. It is a cause that acts on another thing to produce an effect which consist of a change. The concepts of material and formal causes now seem to be archaic in philosophy and have little significance outside aesthetics. Final causes have also been expurgated from physics and they are, in any case, seen to be highly controversial. The notion of effective cause (al-‘illah al-tamma, al-‘illa al-mu’aththira) proceeds on a number of basic postulates which are generally accepted by the advocates of causation. One of these is that the relationship of cause to its effect is a necessary rather than a contingent relation which means that the effect must follow its cause simply because the cause necessitates its effect. Second, everything that exists is an effect to a cause; the cause is either known or unknown, but it exists. This is expressed in the Arabic phrase kull dhi mahiya ma‘lul. Causation as such engulfs everything that exists and nothing is therefore beyond its purview. The third underlying assumption of an efficient cause is that there is only one such cause for every effect, and that an effect cannot be simultaneously brought about by two such causes. For if this were to be accepted, neither of the two causes would be complete in itself, nor efficient for that matter, and it would contradict the necessary relationship of the cause to the effect. Another generally accepted principle of causality is the priority of causes to their effects: the cause precedes its effect and not vice versa. It is similarly stated that the causes necessitate their effects, which means that effects can never necessitate their causes: When the sun shines on a stone, for example, and makes it warmer, it could never be said then that the stone in becoming warmer makes the sun shine on it. It may be noted in passing that philosophers have also distinguished other causes, many of which overlap each other as well as the four of Aristotle. An “immanent” cause, for instance, is one which produces a change within itself, as in the case of a man who produces his own voluntary motions and thoughts. This is distinguished from a “transient” cause, which produces a change in something else. But this distinction too is seldom made now and philosophers seem to have generally ignored it. Cause is, moreover, understood as power in the sense of it having the ability to produce an effect. The sun, for example, has the power to make things grow and to do all the other things it does. It is basically in this sense that God is thought of as the cause of the world, and, accordingly, as a Being who is all-powerful. Christian and Muslim thinkers have both embraced this perception of causation. Note, for example, that the largest part of John Lock’s Essay Concerning Human Understanding, was, in fact, devoted to a discussion of causality in the sense of power. It was David Hume who finally proposed, in An Enquiry Concerning Human Understanding, to eliminate this idea from the conception of causation altogether maintaining essentially that causes and effects are merely changes that we find constantly conjoined. This was basically the idea that the Muslim theologian al-Ghazali had propounded much earlier, and many western philosophers since Hume have held that Hume was basically right not to read the idea of power into causation. Abu Hamid al-Ghazali (d. 505/1111), who basically rejected causality, maintained that the relationship between cause and effect is not that of one to one as the philosophers assumed, but a composite relationship which involves an indefinite number of contributory factors. Even an apparently simple phenomenon such as our seeing an object is complex insasmuch as it depends upon our vision, the conditions of light, absence of dust, the distance and direction of the object from us, its size and colour etc. The effect is thus hardly the result of a singular cause but of a plurality of causes. The same effect may be produced by a number of causes and not necessarily by the cause that is observed. Causes are, in other words, inert entities and cannot produce any effect of their own. The Will of God is the only real cause that brings about all observable effects in the entire universe. Al-Ghazali’s views have been criticised by many equally prominent figures, including Ibn Rushd (Averroes, d. 595/1198) as obscurantist and irrational as I shall later elaborate. Al-Ghazali may have taken the theistic position on causality too far but his views have been profoundly influential. From the theological perspective of al-Ghazali reality is not confined within the four walls of causation, the sensory and material causes alone. Non-material factors too play a role in the emergence of phenomena. More recently Muhammad Iqbal has also voiced the theistic position in his views on causality and took a reductionist stance on causation which I shall address in the following pages. The Ash‘ariyya theological perspective on causality seeks to explain the world and all phenomena, natural and supernatural, in term of the Divine Omnipotence alone. In order to safeguard Divine Omnipotence, it denies the objective realty of causal powers in creatures, and tends to perceive causation as a threat to the sovereignty of God. The scientific perspective on causality seeks to explain the world and all phenomena, including the miraculous, in terms of natural and material causes. There is some recognition in this view, as also shared by Muslim philosophers, of two types of causes, namely immediate and secondary. The Ash‘arite theologians have, however, forcefully rejected the idea of secondary causality and have equated it with the concept of mediation and shirk. Action in the primary sense is accordingly a process of bringing a thing forth into being out of nothing, and this is God’s exclusive prerogative. Action in the secondary sense simply denotes the effects of the primary action in the object. God, in other words, is the only real or first cause of all things. Notwithstanding the theoretical complexity of causation and the differential perspectives of philosophy, theology and science over it, the basic notion of causation is hardly disputable. Causation is not only indispensible in the common affairs of life but in all applied sciences as well. Jurisprudence and law would become quite meaningless if men were not entitled to seek the causes of events such as violent deaths, fire, and accident. The same is true in such areas as public health, medicine, military planning and indeed every area of life. No one doubts that the battle against malaria began with the search for its causes. The search for causes and the need to understand and identify them are typical of the way men manage their practical affairs, and their environment. Any conclusion that is drawn form the debate over causality is likely to have a bearing on its parallel debate over determinism and free will (jabr wa ikhtiyar). Does man have freedom in regard to his action and conduct or is he programmed in an irreversible course of action throughout his life? This naturally raises the next question as to whether man’s will and intention is subject to the law of causality in such a way that the effect obtains automatically in the presence of its cause? What role then causality plays in determining the course of action that man takes? Issues pertaining to causality, free will and determinism have arisen in almost all religions in much the same way as in Islam. Ancient Egyptians, Indian Brahmans, Greek philosophers, Zoroastrians and Christian thinkers raised these questions even before the advent of Islam. Their recurrence among Muslim thinkers is partly due to the fact that the Qur’an contains evidence which lends support to both free will and predestination. The Qur’anic evidence that is reviewed in the following pages is clearly indicative of a blended approach to these issues: The Qur’an does not reject either free will or determinism, nor does it totally support them, but tends to take a blended and composite approach toward them. The destiny of every man is tied to the causes that precede it. Causality is thus related to the question of destiny. Whether one accepts the existence of a divine principle or not has, on the other hand, little bearing on the question of free will and predestination: One may either attribute the system of cause and effect to the will of God, or assume that it is independent and has no connection to a divine order. Determinism can likewise be attributed to the will of God, or to causality. What we mean by destiny may then be a function of a divinely preordained programme, or that it is the inseparable link of every phenomenon with its cause. It is God who causes the seed-grain and the date-stone to split and sprout. He causes the living to issue from the dead, and dead to issue from the living.” (al-An‘am, 6:95). He it is that cleaves the daybreak (from the dark) (al-An‘am, 6:96). It is He who sends down ran from the skies, with it We produce vegetation of all kinds. It is not you who slew them; it was God: when you threw a handful of dust, it was not your act, but God’s (al-Anfal, 8: 17). In all these verses there is no reference to a secondary or horizontal cause. The only cause identified is God as the direct and sole cause of the phenomena in question. The last verse which refers to the divine help given to Muslims at the Battle of Badr may be said to be more explicit in its denial of the power of causation in created beings. None of these passages, however, provide conclusive evidence as to the involvement or otherwise of other factors or causes in the acts described. The Qur’anic language may thus be read literally in these passages, or figuratively, perhaps, as proof of the Omnipotence of God rather than a description of the precise nature of causality as such. This is in fact the view of the Indian reformist thinker, Sir Syed Ahmad Khan (d. 1898), who has rejected the assertion that the Qur’an teaches determinism. God in the Qur’an ascribed to Himself the acts and conduct of His creatures, just as He did with regard to things and phenomena which are cause by some other causes. The Qur’an says God caused the rain to fall. He planted the trees and caused the rivers to flow. This mode of speech does not mean that there were no intermediate causes and the Qur’an has no intention of proving or disproving freewill or predetermination. The purpose is merely to impress the greatness of God on the human mind and to show that everything is caused by God who is the ultimate cause of all things. Therefore ‘it is not right to argue from the Qur’an in favor free will or predetermination’. The theistic philosophy of Kalam originated in early theological and political debates in Muslim community concerning such problems as the attributes of God, the relationship of faith to deeds, freewill and predestination, causality, the definition of a believer etc. Most of these issues arose in conjunction with specific internal factors that were then experienced by the community and were both religious and political in nature. The debates that ensued led to the emergence of various sectarian movements. The most well-known of these were the Murji’ites, Qadariyya and Khawarij. It was out of these that the first systematic theological school, namely the Mu‘tazila, emerged. Many of the rationalist doctrines of Mu‘tazila were subsequently challenged by the Ash‘ariyya. Although the Ash‘ariyya gained wider acceptance, their views on many issues, including causality, have often been criticised. The influence of Greek philosophy and internal political developments under the Umayyad and early Abbasid rulers are often cited as relevant factors to explain the course of developments in Kalam. Scholastic theology was evidently not as well received as the juristic schools of Fiqh: Whereas the schools of Fiqh have continued to have followers to this day, the schools of Kalam lost support and became extinct. Classical Greek philosophy and the medieval Jewish, Christian and Islamic philosophy generally accepted the Aristotelian notion of causality. In this notion a necessary link existed between cause and effect and explicit recognition was given to the role of finite, created beings as horizontal or secondary causes in nature. The notion of horizontal and secondary causes did not necessarily deny the existence of a first of primary cause that vested the secondary causes with their natural potency. Yet God as the first cause was not a distinguishing feature of Aristotelian causality. The theistic notion of hierarchical causality and emanation of all causes from the Primary Cause did not develop until Ibn Sina’s (Avicenna-d. 428/1037) metaphysical cosmology became known to medieval philosophy. Kalam began to takes shape toward the end of the seventh, or beginning of the eighth, century at the hands of such scholars as Hasan al-Basri (d. 728 CE) and his disciples Wasil b. ‘Ata (d. 748) ‘Amr b. ‘Ubayd (d. 762) and others, who led the early Qadariyya movement. These were the advocates of free will and argued that man has the ability to create his own conduct, both good and evil. Al-Basri held, in response to a query by the Ummayyad Caliph, Abd al-Malik b. Marwan (d. 705) that both the Qur’an and reason affirm that God, Who is supremely just, cannot hold people accountable for action over which they have no control. When asked what he thought of those kings (the Umayyad caliphs) who spilt the blood of Muslims and took their possessions and then said “our actions are part of God’s decree – (qada wa qadar)”, al-Basri answered “these enemies of God are liars.” The controversy over free will and predestination had serious political implications as the early Qadaris had challenged the authority of the Umayyad rulers. Two of their leaders, Ma ‘bad al-Juhni and Ghaylan al-Dimashqi who did so were put to death by order of the Umayyad caliphs in 699 and 743 respectively. The execution of Ma‘bad and Ghaylan put life in their causes. Thousands of people in Sham and in Iraq subscribed to the Qadariyya and subsequently the Mu‘tazilah- Wasil b. ‘Ata and Amr b. ‘Ubayd. The two Mu‘tazila leading figures embraced some of the Qadariyya views and modified others; and it is due mainly to their scholarly works that the Mu‘tazilla gained prominence. The Mu‘tazila maitained that man has the capacity to act freely. One of their leading figures, Abu al-Hudhayl al-‘Allaf (d. 235/841) thus advanced the concept of regeneration (tawalud), or the causal relation between the action of the doer and the deed. The acts “generated” by man can be divided into those of which he knows the modality (kayfiya) and those which he does not. An example of the former is the flight of the arrow, or the sound caused by the impact of two solid objects. An example of the latter is pleasure, hunger, knowledge etc. Man is the author of act of which he knows the modality, whereas act which he cannot observe nor scrutinise must be attributed to God. In this regard Abu’l Hudayl departed from the teaching of Bishr b. al-Mu‘tamir (d. 825 CE), head of the rival school of Baghdad, who inaugurated his modified doctrine of generation (tawallud) and held that “whatever is generated from our deeds is our doing” irrespective of whether we can scrutinize it or not. This doctrine recognised the human will as a basic component of causality that created effects independently of their causes. The determinist (Jabriyya) response to the notion of tawallud was that creation implies knowledge of the effects of creation, in every respect, on the part of the creator. Man’s knowledge falls short of this, as man has only a general knowledge of the effects of his actions. To overcome the difficulties involved in the tension between human capacity and divine power, Ibrahim al-Nazzam (d. 835) resorted to the concept of kumum: both in reference to the inherent nature (tab‘) and that of God’s initial creation of the latent properties of things (kumum) subsequently manifested externally (zuhur). Nazzam appears to ascribe every activity in the world indirectly to God and directly to secondary natural agents. This modified version of determinism was, however, not supported either by the rest of Mu‘tazila or by their opponents, the Jabriyya. Mu‘tazilism was publicly supported by the Abbasid Caliphs al-Ma’mun (d. 218/833) and his immediate successors, Al-Mu‘tasim (d. 227-841) and al-Wathiq (d. 232/846). They became, however, aggressive and intolerant, in clear violation of the Islamic teachings, when they resorted to inquisition (mihna) that led to the punishment and abuse of many leading ‘ulama of the time. The determinists, or Jabriyya, grow in opposition to the Qadariyya and denied the doctrine of free will (ikhtiyar). Jahm b. Safwan (d. 131/745) who resided in Kufa advocated absolute determinism and maintained that man can have no part in his action in any real sense. The limbs of human body are like tools in God’s hands who creates the actions in a manner over which man has no power, will or choice. Unlike the Qadariyya who accepted causality as a necessary part of human conduct the Jabriyya effectively nullified causality and held that no cause would produce any effect as everything was determined by God. with God. For al-Ash‘ari God’s power is unlimited and His decrees irreversible, therefore all good or evil is the result of God’s decree and fore-ordination, which no human can alter or escape. Nevertheless, al-Ash‘ari, much as he rejected the free will doctrine of Mu‘tazilites, was not willing to endorse the strict determinist views of their opponents. He opted instead for a theory of acquisition (kasb) according to which God creates the human acts as well as the power (qudra) and choice (ikhtiyar) that are exercised in respect thereof, but man acquires them and becomes accordingly liable to punishment or reward for them. Voluntary actions are thus created by God but acquired by the human agent. Creation thus differs from acquisition in that the latter is the outcome of the “created power” of the agent, so that the same action is said to be created by the one and acquired by the other. Man thus acquires credit or discredit for the deed created by God. Since it is impossible that God should acquire it in time, while He is its author eternally. Ash‘arism remained the dominant school of thought due partly to the excesses of Mu‘tazilism, and the support of many of its prominent defenders including al-Ghazali (505/1111), al-Shahrastani (d. 548/1153), Fakhr al-Din al-Razi (d. 606/1209) and many others. The world which means everything other than God, consists of transitory elements, atoms and accidents, created and recreated from one instantaneous period to the next. The world is thus not only created ex-nihilio but it is kept in existence by a process of continuous recreation out of nothing, with God’s power and will being the only cause and explanation for its continuity. What we normally think of as causes and their effects are really creations out of nothing which do not persist after their creation. There is consequently no connection between one moment of creation and the next and therefore no horizontal nexus between things. The Ash‘arites thus atomise matter, space, and time as a result of which the universe becomes a domain of separate and disconnected entities. There is harmony in nature only because it is created and governed by God. Since all things are attributed to God there is no recognition of horizontal or secondary causes. system etc. A tree in other words cannot exist without the whole universe, and no single cause can therefore be held accountable for its growth. In short, since all things are contingent and limited but they all interact in harmony resulting in a faultless order, the conclusion is drawn that they are created and governed by one Absolute Being. The Shi‘a Imamiya take the intermediate position (al-amr bayn al-amrayn) between determinism and free will. They do not subscribe entirely to the Ash‘arite determinism nor to the Mu‘tazila view that regards man the master of his own destiny. The Imamiya concur with the determinist position in regard to the basic norms of the universe, the awamir takwini, such as the creation of man and the world of animate and inanimate beings where man has no role to play and all is determined by God. This is what the intermediate posture (amr bayn amrayn) actually means. For Ibn Sina (Avecenna, d.428/1037) every event has a cause and no event is without it. The chain of causation cannot, however, be traced back indefinitely. Yet to assume that there is a first causeless cause in this chain questions the very basis of causation that every event has a cause. On the other hand, it is also impossible to think of an indefinite regress of causes which starts nowhere. The chain of causation must therefore start in the first causeless cause, that is God, who is a necessary Being. “God is the supreme efficient cause, the necessary and sufficient condition for the existence of the world, the effect”. As for the nature of causal connection, Ibn Sina observed that even if we cannot actually observe the causal connection, we can over a period of time observe regular connections which lead us to make justifiable inferences about causal connections and future events despite the unobservablity of the causal nexus. Ibn Sina argued that logically this nexus is necessary rather than contingent. Effects do not just happen to be brought about by their causes, nor are they events which now and then follow other events. The effects must follow their causes, because they are necessitated by them, and the whole of creation is a necessitated and necessitating series of events. If indeed fire was not a burning agent, then God would not have commanded the fire to cool. The philosophers may respond that it is of the nature of fire to burn, and of the cotton to be burnt, and when they come into contact, a conflagration is inevitable. Yet Ghazali points out that observation proves only simultaneity, not causation. Al-Ghazali added that it is God who causes things to exist and continually recreates them if He wishes them to remain in existence. Since the cause and their effects exist for too short a time for a significant connection to take place between them, one can only say that the effect occurs with the cause (ma‘ahu) rather than by it (bihi). It is God’s custom, al-Ghazali maintained, that once an object has been created, He continues to create it over and over again. Thus the uniformity of the physical world is the manifestation of God’s custom not of causation. Logic implies the existence of causes and effects, and knowledge of these effects can only be rendered perfect through knowledge of their causes. Denial of causation implies the denial of knowledge, and denial of knowledge implies that nothing in this world can really be known, and that what is supposed to be known is nothing but opinion, that neither proof nor definition exists, and that the essential attributes which compose definitions are void. Will you save from the fire of Hell one against whom the decree of punishment is justly enacted? (al-Zumar, 39: 19). كتب معاوية إلى المغيرة: أكتب إلي ما سمعت النبي صلي الله عليه و سلم يقول خلف الصلاة. فأملي علي المغيرة قال: سمعت النبي صلعم يقول خلف الصلاة: لا إله إلا الله وحده لا شريك له. In a discussion that occurred between Adam and Moses, peace be on them both, (in the presence of God) Moses said to Adam: God created you by His Hand and breathed into you of His spirit, (and made) the angels prostrate to you; God then admitted you in Paradise and then you brought down the people, because of your error, to this earth! Adam replied to Moses: you are the chosen of God, He honoured you with His speech and revealed the scripture to you; how long was it that God created the Torah before He created me. Moses replied: Forty years. Then Adam asked: Did you find in it the verse (and Adam disobeyed his Lord, so he was led astray)? Moses replied “Yes”. Adam then told Moses: You blame me for an act I did which God had prescribed for me to do forty years before He created me. The Prophet (Muhammad) then said “Adam reasoned with Moses as such” (he said this three time). Two angels visit every foetus in the womb upon completion of forty or forty five nights and say: O Lord! Is it misguided or righteous? Then they write (the answer). Then they ask: O Lord! Is it male or female? Then they write (the answer). They also write its deeds, wealth and means of livelihood, and time of death. Then they roll off the parchment to which nothing is added nor detracted afterwards. The Qur’anic ayah quoted in this hadith evidently means that God makes the soul and gives it order and proportion in order to adapt it for the particular circumstance in which it has to live its earthly life. God inspires into it an understanding of right and wrong and the circumstances in which it may be placed. The Qur’anic verse that the Prophet quoted here indicates that the proportion and measurement in question may to human beings seems gradual, unfolding over time, but in God’s command, the plan, the word, the execution and consequence are but a single momentary act. The proportion and measurement is written in the preserved tablet (al-lawh al-mahfuz). We have shown man the path (to truth and deliverance); whether he be grateful or ungrateful (rests on his will) (al-Insan, 76:3). انا هديناه السبيل إما شاكرا و إما كفورا. Certainly you are accountable for what you do. (al-Nahl, 16:93). There shall be no compulsion in religion. Guidance has been made clear from misguidance, one who rejects evil and believes in God has verily clung to a firm hand-hold …(al-Baqara, 2:256). And this is My straightened path. Follow it and follow not paths that lead you away from this path. Thus God advises you that you may be righteous (al-An ‘am, 6:153). Truly God will not change the condition of a people until they change it themselves (al-Ra‘d, 13:11). This revelation is a reminder, whoever wishes (to take it) will take a straight) path to his Lord (al-Insan, 76:29). Enlightenment (basa’ir) has come from your Lord to open your eyes. He who sees does so for his own good, and he who shuts his eyes does so to his own detriment (al-An ‘am, 6:104). Whoever does the smallest good deed shall experience the result of it, and whoever does the slightest evil deed shall experience the result of it. (al-Zilzal, 99:7-8). Evidence also shows that God does not stand in the way of the miscreants: He surely gives them the power and capacity to do evil, just as He gives them the ability to do good and smoothens their path (fa-sa-nuyassiruhu li’l yusra… fa-sa-nuyassiruhu li’l ‘usra) (al-Layl, 92:7,10). The associators will say: had God willed, we and our ancestors would not have been associators… say do you have knowledge of this to show us. You only follow your conjecture and you say but lies (al-An‘am, 6:149) (see also al-A‘raf, 7:28 and al-Zukhruf, 43:20-21). If it is said (by the transgressor): if only God had guided me, I would certainly have been among the righteous … The reply will be: no, My signs came to you, but you rejected them, became arrogant and became one of the disbelievers. (al-Zumar, 29:57,59). Whereas much of the early discourse on causality, predestination and free will occurred in sectarian contexts., modern opinion on these issues does not, on the whole, seem to relate to the kalam dialectics of earlier times. This is shown by our review of modern opinion as follows. Jamal al-Din al-Afghani (d. 1897) rejected as exaggerated the views of both the determinist (Jabriyya) and those of the western critics of Islam who assumed erroneously, as if determinism was the normative and generally accepted doctrine. Al-Afghani noted that none of the prevailing groups of Muslims, whether the Sunnis or Shi‘ah, Zaydi, Isma‘ili or Wahhabi believe in pure determinism and that the Jabriyya as a sect did not leave a lasting impact among Muslims. The Muslims generally subscribe to the belief that man is partially free within the meaning of the doctrine of acquisition or kasb. Al-Afghani stressed that the critics often failed to distinguish between the doctrine of jabr (compulsion) and that of qada wa qadar (predestination). Belief in qada wa qadar is a part of the dogma of Islam, the belief that all things in the universe happened by sequence of cause and effect – God Himself being the first cause, the human will and decision are a necessary part of that sequence. Muhammad Abduh (d. 1905) believed in predestination with regard to the mores, temperament, and characteristic behaviour of nations: God created them the way they are. But as far as individual behaviour is concerned, ‘Abduh refuted the doctrine of jabr and said that the Qur’an condemned it and affirmed acquisition (al-kasb) and free will (al-ikhtiyar) in no less than sixty four verses. The Prophet of Islam also endorsed this in his words and conduct. The Indian Reformist thinker Sir Syed Ahmad Khan (d. 1898) believed in a version of predestination as he held that man’s acts flow from his physical constitution, and men are not, therefore free to act and behave absolutely as they like. If a foolish person and a wise person could exchange their physical constitution, then the foolish person would act like the wise person and vice versa, which is normally not possible. Scientists who studied human behaviour found that man lacks freedom of will in regard to his attachment to social, national, and cultural norms, and also with regard to the training and education he receives. Shibli Nu‘mani a colleague and contemporary of Sir Syed also held a partially determinist view on account of causation. Generally, the people say that desire and intention depend on our choice. But this is erroneous. When all the causes leading to an action converge on one point, it is impossible that the desire to commit such an action should remain in abeyance. Therefore our desire itself is not within our control. If we chose a certain course of action, our choice is also not free. Syed Ameer Ali (1928) too spoke in support partially of determinism and quoted Ibn Rushd as saying that our actions depend partly on our free will and partly on extraneous causes. We are free to wish and to act in a particular way but our will is always restrained and determined by exterior causes. These causes spring from the general laws of nature. Fazalur Rahman upheld a middle course between free will and determinism. Taqdir according to Fazlur Rahman is to be understood in terms of powers, potentialities and dispositions rather than preordained events and happenings as it is popularly understood. Events in the world are never preordained by God, nor indeed by physical forces. That an event shall occur at a certain time remains an open possibility among other alternatives, until it is actually caused. This is because what is determined are not events, but potencies, powers and forces. Thus it is determined that oxygen has a potency that when mixed with hydrogen in a certain proportion and under certain conditions the result will be water. The actual events of their being turned into water at a definite space and time is never predetermined and depends on a host of factors. As can be seen, there is a wider support for ikhtiyar and only a partial support for determinism. The views that we examined tend to convey the concern that the whole concept of religious guidance would otherwise be faced with internal contradiction in a predominantly deterministic context and outlook. The wider support for ikhtiyar and the limited recognition for predestination and determinism that we have seen here are, I believe, in harmony with the balance of the evidence that I have examined in the Qur’an. The modernist stance on these issues also seems to be more balanced and reasonably free of some of the exaggerations of the earlier scholastic discourse. The Mu‘tazila upheld the principle of causality and considered human freedom as a necessary postulate both of man’s moral responsibility and of God’s justice. They vindicated God’s justice which the determinists had threatened and which the Qur’an had clearly upheld. By reducing human action and the principle of causality to mechanical occurrences, the determinists made a mockery both of man’s responsibility and divine justice. The Mu‘tazila tried to correct this imbalance but they too went so far as to embrace the view that it is obligatory on God to reward the virtuous and punish the deviant and that He cannot do otherwise. Contrary to this, the Ash‘arites believed that reward and punishment are God’s absolute prerogatives; He rewards whom He wills and punishes whom He wills. What hurt the Mu‘tazila cause most was its failure to appreciate the limits of reason. They also showed intolerance of opponents. Intervention by Umayyad rulers to impose the Mu‘tazila view on the populace led to distortion and indulgence in unproductive, hair-splitting debates, which had no basis in the Qur’an and Sunna and were plainly excessive. The Ash‘arite support for rational proofs and syllogism also prompted them into positions that deviated from the path of orthodoxy. For the major schools of law, there was little to chose between Mu‘tazila and Ash‘arites. Consequently the kalam itself became the target of protest. Al-Shafi‘i (d. 205) denounced the kalam advocates as having “forsaken the Qur’an and Sunna” and deserve public condemnation. Ibn Taymiyah (d. 728/1328) observed that the philosophical movement had become totally discredited. He even said that “there is no philosophy in Islam” and that the philosophers are misguided! The reason for this was not their views on causality, but their indulgent speculative thought. Ibn Taymiyya upheld causality and criticised the Ash‘ariyya for their denial of efficient cause and said that those who deny them violate the Qur’an, the Sunna and consensus (ijma‘) of the pious predecessors (salaf). Ibn Khuldun (d. 808/1406) who was a rationalist himself devoted a chapter on “Refutation of Philosophy” in his Muqaddima and wrote that the philosophers did not acknowledge their limitations and did not realise that the universe was too vast and complex to be comprehended entirely by human reason and senses. If there were no free choice for man, the whole concept of man’s religious accountability would be unjust. The oppressive tyrant would deserve no blame and the just would merit no praise, because responsibility has meaning only within the sphere of what is possible and attainable. However the affirmation of free will does not necessarily affect the all-embracing attribute of God’s power, because He has willed that we should freely take our own decisions, in accordance with the norms and law He has ordained. The argument that affirmation of man’s free will amounts to duality and a challenge to the sovereignty of God is clearly exaggerated. For man’s will does not set itself up in opposition to the divine will, nor is man’s will contrary to what God desires. For it is God who makes free will a part of man, and it is He who bestows it upon human beings. The mistake made by both the determinists and the protagonists of unlimited free will is that they have imagined man to have only two possible roads before him: either all his acts must be attributed exclusively to God, so that he then loses all freedom and turns into a robot, or else that he is obliged to accept that his volition inheres in an independent and unbounded essence, which entails limitation on God’s power. From one point of view, man’s deeds can be attributed to him, and from another point of view to God. Man has a direct and immediate relationship with his own deeds, while God’s relationship with those deeds is indirect. Both forms of relationship are real and neither is necessarily antithetic to the other. The fact that the Qur’an provides some evidence for all of this is perhaps indicative of the validity of a conciliatory approach to the understanding of these issues. One can either read this evidence and try to reconcile and understand it, or to read irreconcilable conflicts therein. Man in Islam does not possess absolute free will that would enable him to act outside the parameters of God’s will, nor is he free to act outside the norms of causation. Man is also not a prisoner, in the meantime, to a mechanism that prevents him from choosing his own path in life, nor is he a slave, like an animal, to his instincts. Attribution of man’s volitional acts to God is unwarranted. In all of the Qur’anic verses that are concerned with God’s will, there is none which attributes man’s volitional acts to the divine will. and general opinion among Muslim scholars has upheld this position, not only because the Prophet has instructed so, but also because it is tantamount to fathoming the unfathomable, something which is beyond human capacity. The Qur’an has clearly stated, in more than one place, that God has shown man the path to salvation but man is not compelled to follow it, and when he does reject guidance, he does so to his own detriment. There is, moreover, much support in the Qur’an and Sunna for supplication and prayer (do‘a) that encourages the believer to solicit God’s help and benediction in all matters of concern to him. The Qur’an also provides, in numerous places, authority and support for repentance (tawba) and God’s willingness, even pleasure, to grant it to those who desire to change themselves for the better. Thus it would appear that God leaves open the possibility of change in the human predicament when the human agent is ready and earnest to pursue it. The critic may say again, perhaps, that supplication and repentance could be read within the purview of predestination. Yet it would be difficult to accept such an assertion as it would render both meaningless. The Qur’an can hardly be expected to take emphatic positions on the efficacy and virtue of do‘a and tawbah in so many places and then to close the door to both through unmitigated foreordination and determinism. By Mohammad Hashim Kamali, International Islamic University Malaysia. Cf. Richard Taylor, “Causation”, The Encyclopedia of Philosophy, ed. Paul Edwards, New York: Macmillan Publishing co. 1967, vol. 1, p. 56; Michael E. Marmura, “Efficient Causality in Avecinna”, in ed. Michael E. Marmura, Islamic Theology and Philosophy, Albany: State University of New York, 1984, p. 177. Among Muslim philosophers, Abu Yusuf Ya ‘qub bin Ishaq al-Kindi (d. 252/866) was the first to discuss the four types of causes and pay tribute to Aristotle’s pioneering work on it. Cf. Majid Fakhry, A History of Islamic Philosophy, New York: Columbia University Press, 1970, p. 70. See also Yamine Bouguenaya Mermer, Induction, Science and Causation, Some Critical Reflections, Occasional paper 32, Islamabad: Islamic Research Institute, 1996, pp. 12-13. This is expressed in the Arabic phrase “takhalluf al-ma‘lul ‘an al-‘illa al-tamma mahal”, (it is impossible for the effect to deviate from its efficient cause”. See for details Ghulamhasan Ibrahimi Dinani, Qawa‘id-e Kulli Falsafa dar Islam, Tehran: Anjuman-e Shahenshahi Falsafa-e Iran, 1398/1979, p. 234. This is expressed in the Arabic phrase “tawarud al-‘illatayn ‘ala ma‘lul wahid mahal”. See for detail Denani, Qawa‘id, n. 2, p. 157. The Encyclopedia of Philosophy, n. 1, I, 59. Taylor “Causation”, The Encyclopedia of Philosophy, n. 1, I, 57. Taylor, “Causation”, TheEncyclopedia of Philosophy, n.1, I, 58; Oliver Leaman, An Introduction to Medieval Islamic Philosophy, Cambridge: Cambridge University Press, 1985, p. 77. Abu Hamid al-Ghazali, Tahafut al-Falasifa, ed. Jirar Jihami, Beirut: Dar Fikr al-Lubnani, 1993, p. 169. See also M. Saeed Sheikh, Studies in Muslim Philosophy, 3rd edn., Lahore: Shah Muhammd Ashraf, 1974, pp. 147-48. Cf Sayyid Mujtaba Musavi Lari, God and His Attributes: Lessons in Islamic Doctrine, Potomac: Maryland: Islamic Education Center, 1989, p. 186. Cf. Osman Bakr, Tawhid and Science: Essays on the History and Philosophy of Islamic Science, Kuala Lumpur: Secretariat for Islamic Philosophy and Science, 1991, p. 96. Cf. Abu Nasr al-Farabi, al-Madina al-Fadila, Beirut: 1995, p. 23; Majid Fakhry, History of Islamic Philosophy, n. 1, pp. 78-79. Cf. Ahmad Amin, Fajr al-Islam, 14th edn. Cairo: Maktabat al-Nahda al-Misriyya, 1980, p. 284. Sayyid Mujtaba Musavi Lari, God and His Attributes: Lessons on Islamic Doctrine, Eng. Trans. Hamid Algar, Potomac MD: Islamic Education Center, 1989, p. 190. Cf. Muhammad Iqbal, The Reconstruction of Religious Thought in Islam, Lahore: Shah Muhammad Ashraf, reprent 1982, p. 42. See also other verses especially in al-An‘am, 6:101; al-Waqi‘a, 56:63 and al-Mulk, 67:19. Quoted in Mazheruddin Siddiqi, Modern Reformist Thought In the Muslim World, Islamabad: Islamic Research Institute, 1402/1982, p. 61. Cf. Osman Bakr, Tawhid and Science, n. 9, at 81; Ahmad Amin, Fajr al-Islam, n.12, p. 284 f.
 cf. Osman Bakr, Tawhid and Science, n.9, pp. 93, 148. Majid Fakhry, “Philosophy and Theology”, in ed. J.L. Esposito, The Oxford History of Islam, Oxford: OUP, 1999, p.277; Ahmad Amin, Fajr al-Islam, n. 12, p. 285. Ahmad Amin maintains that these executions were not for purely doctrinal reasons, saying that Ma‘abad took part in the revolt of Ibn Ash‘ath. Ghaylan was articulate and exposed the rulers’ misdeeds. Abu al-Hasan ‘Ali b. Isma‘il Al-Ash‘ari, Maqalat al-Islamiyyin wa Ikhtilaf al-Musalliyyin, Cairo: al-Maktabah al-Nahdah al-Misriyya, 1969, p. 402 f; Majid Fakhry, History of Islamic Philosophy, n. 1, p. 48. Id., p. 401; Abu Mansur Abd al-Qahir al-Baghdadi, al-Farq bayn al-Firaq, ed. Taha ‘Abd al-Rauf Sa‘d, Cairo: Mu’assasa al-Halabi, n.d. 143.
 al-Ash‘ari, Maqalat al-Islamiyyin, p. 403. Abu al-Hudhayl names “will” among things “man causes in himself” as opposed to what he causes in other things. Al-Baghdadi, al-Farq, n. 21, p. 129; Muhammad Sayyid ‘Abd al-Karim al-Sharastani, al-Milal wa’l Nihal, ed. Muhammad Sayyid Kaylani, Cairo: Mustafa al-Babi al-Halabi, 1961, vol. I, p. 39. Cf. Ahmad Amin, Fajr al-Islam, p. 286; Umar Capra, “Is Rationalism Possible in the Muslim World?”, The American Journal of Islamic Social Sciences, 16 (1999) 109. Al-Baghdadi, al-Farq Bayn al-Firaq, p. 128; Majid Fakhry, “Philosophy and Theology”, Oxford History of Islam, n.19, p. 278. Shahrastani, al-Milal, n. 23, p.68 f; M. Saeed Sheikh, Studies in Muslim Philosophy, Lahore: Shah Muhammad Ashraf, 3rd edn., 1974, pp. 28-29. Majid Fakhry, “Philosophy and Theology”, n.19, p. 280. Richard J. McCarthy, Theology of al-Ash‘ari, Bayrut, Lubnan, n.p., 1953, p. 238; Fakhry, History of Islamic Philosophy, n.1, p. 208. Al-Ghazali, Tahafut al-Falasifa, n.8, p. 169; Oliver Leaman, Averroes and His Philosophy, Oxford: Clarendon Press, 1988, p. 57. Cf. Osman Bakr, Tawhid and Science, n.10, pp. 87-91; Sheikh, Studies in Muslim Philosophy, n. 26, p. 145. Mermer, Induction, Science, and Causation, n. 1, p. 19; Sheikh, Studies in Muslim Philosophy, n. 26, pp. 147-48. Sultan al-Wa‘izin Shirazi, Goroh-e Rastagaran Ya Firqa-e Najiya, Tehran: Kitabfurshi Islamiyeh, 1985 A.H., vol. II, pp. 686-688. Verily when He intends a thing, His command is “Be” and it is (Yasin, 36:82). Michael Mermura, “Efficient Causality in Avicenna”, in ed. Michael Mermura, Islamic Theology and Philosophy, n. 1p. 175; see also Sheikh, Studies in Muslim Philosophy, n.26, pp. 120-121. Leaman, Averroes and His Philosophy, n. 28, p. 55. For details see Marmura, Ghazali and Demonstrative Science,” J. of the History of Philosophy, 111 (1965), 183-204; see also Leaman, Averroes and His Philosophy, n. 28, p. 56. Abu Hamid al-Ghazali, Tahafut al-Falasifa, ed. Jirar Jihami, n. 8, p. 169; see also Leaman, Averroes and His Philosophy, n. 28, p. 56; Bakr, Tawhid and Science, n. 10, p. 99; Saeed Sheikh, Studies in Muslim Philosophy, p. 145. Cf. Mermer, Induction, n. 1, p. 16; M. ‘Umaruddin, The ethical Philosophy of al-Ghazali, Lahore: Shah Muhammad Ashraf, reprint, 1982, p. 90. Abu’l Walid Ibn Rush al-Qurtubi, Tahafut al-Tahafut, ed. Maurice Bouyges, 3rd edn., Bierut: Dar al-Mashriq, 1992, p. 584; see also Leaman, Averroes And His Philosophy, n.28, p. 85; Osman Bakr, Tawhid and Science, n.10, p. 94. Bukhari, Sahih al-Bukhari, Eng. Trans. Muhammad Muhsin Khan, Kitab al-Qadar, Bab la mani‘a lima a‘ta Allah, vol. VIII, hadith 612. Muslim, Mukhtasar Sahih Muslim, ed. Muhammad Nasir al-Din al-Abani, Kitab al-Qadar, bab fi’l Khalq yukhlaq qa’shshaqawa wa’sa ‘ada, hadith 1848. Id., hadith 1843. See also note 6152 in the Holy Qur’an, translation and commentary by Abdullah Yusuf Ali. Cf. Muhammad ‘Ali al-Sabuni, Safawat al-Tafasir, Beirut: Dar Kutub al-Islamiyya, 1980/1401, p. 290; The Holy Qur’an, Translation and Commentary by Abdullah Yusuf Ali, note 5164. Siddiqi, Modern Reformist Thought, n. 16, p. 58. Shibli Nu‘mani, Maqalat-e Shibli, Azamgarh, India, 1932, vol. I, p. 47. Syed Ameer Ali, The Spirit of Islam: A History of the Evolution and Ideals of Islam, London, Christophers, reprint, 1935, p. 632. Iqbal, Reconstruction , n.14, p. 108. Fazlur Rahman, Islamic Studies 5 (1967) pp. 6-7; see also Siddiqi, Modern Reformist thought, p. 63. This view is attributed to the Mu‘tazila leader Ibrahim al-Nazzam (d. 845 C.E.). cf. Abu Ridah Muhammad Abd al-Hadi, Tarikh al-Falsafa fi’l Islam, 3rd edn. Cairo University, Kulliyat Adab, 1374/1954, p.86. al-Shahrastani, al-Milal, n. 23, p. 31; Fakhray, History of Islamic Philosophy, n. 1, p.47. Ignz Golzher, Introduction to Islamic Theology and Law, p. 82. Cf. Chapra, “Is Rationalism Possible?”n.24, 116. Taj al-Din ‘Abd Wahhab al-Subki, Tabaqat al-Shafi‘iyya al-Kubra, Cairo: Matba‘a al-Husayniyya, 1324 H, vol. I, p. 241; see also Goldziher, Introduction to Islamic Theology and Law, p. 111. Taqi al-Din Ahmad Ibn Taymiyya, Majmu‘ al-Fatawa Shaykh al-Islam Ahmad Ibn Taymiyya, ed. Abd al-Rahman al-’Asimi, Riyadh: Matabi‘ al-Riyadh, 1381-83/1961-63, vol. 9, pp. 288. Abd al-Rahman Ibn Khaldun, Muqaddima, Cairo: al-Maktaba al-Tijariyya al-Kubra, n.d. p. 514. Cf. Musavi Lari, God and His Attributes, n.13, 181. Cf. Muhammad ‘Abduh, Risalat al-Tawhid, 6th edn. Cairo: Dar al-Manar, 1973, p. 51; see also M. H. Kamali, Freedom of Expression in Islam, Cambridge, The Islamic Tests Society, 1997, p. 151. Cf. al-Baqara, 2: 186; Al-‘Imran, 3:38; Ibrahim, 14:39; al-Ahqaf, 46:5. 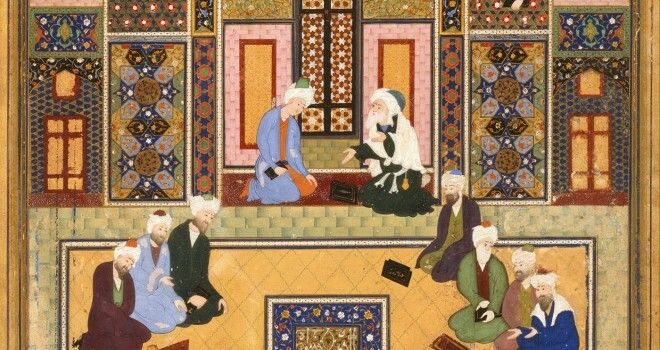 Detail from ‘The Meeting of the Theologians’ by Abd Allah Musawwir, mid-16th century. Courtesy Wikipedia.